As a business owner, you’re undoubtedly aware of the importance of your company engaging in charitable work and giving back. Demonstrating social responsibility in the form of charitable donations, both in terms of time and money, creates a more positive public perception among your customers and potential employees, while also creating a more engaged workforce. In fact, studies show that not only do consumers consider a company’s charitable donations when making spending decisions, prospective employees are also more willing to work with a company that is committed to supporting good works. However, despite all of the positive that can come from your company’s involvement with charity, there can also be some negatives. While it’s important to promote your company’s efforts, too much promotion, or promotion that feels fake or somehow disingenuous can actually do more harm than good to your company’s reputation. Most consumers are remarkably adept at identifying when they are being manipulated, so it’s important to communicate your efforts in such a way that they both understand and support your efforts. Therefore, when developing your PR strategy, consider these important tips. Which is more meaningful: A photo of an executive in a suit handing over a check to a charity at some black tie event, or photos of employees actually engaged in activities to support an organization? All too often, a business’s charitable activities are reduced to photo opportunities or a blurb in the local paper or company newsletter. Because these are so common, they are often reduced to white noise, and don’t really mean anything to anyone. Often, people are less interested in hearing about your contributions to a charity than they are in knowing how your work is making a difference. Anyone can write a check — how is your check, or your employee volunteer program, or your company challenge actually helping organizations reach their missions? Work with your chosen charities to develop specific projects, and share the results of those projects with your audience. When you can show how your support is making a difference, your motivations become clearer — as do the benefits of working with your company. 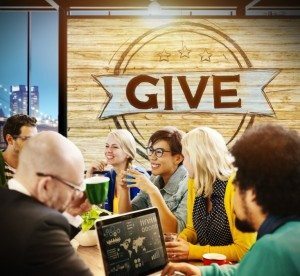 Employees can be your greatest resource when it comes to charitable activities, both in terms of the time and money you can provide to charities, but also in spreading the word and promoting your work. They can only do that, though, if they understand who they are supporting and why. Think about how many times you are asked to donate at the register when you are shopping — how many of those employees can actually talk about the organizations their company supports? How many can tell you what the money is for? If your company is going to give to charity, it’s vital that you educate your staff about what you have chosen to support and why. They should not only be able to name the organizations you support, but be able to explain what the organizations actually do and why the company supports them. Otherwise, our charitable activities aren’t likely to be seen as a company effort, but rather something that only leadership is involved with. Sometimes, the best promotion that you can give your charitable efforts is no promotion at all. If your business is consistently involved with volunteer work, and consistently gives money, others will notice. Often, companies will schedule a single volunteer work day, or donate the proceeds with a fundraiser, and make a big splash, but then disappear until the next time they need a PR boost. Such efforts often feel disingenuous, and more focused on the giver’s needs than the recipient. To get the most from your charitable efforts, be consistent, and make an effort to support causes on an ongoing basis — chances are, someone else will notice and promote your work for you. Promoting your company’s charitable work via social media, company blogs and newsletters, and media outreach is a good way to build a reputation for social responsibility, but only if you establish a foundation of authentic commitment. Consider the underlying message of your promotional efforts, and build real value for your company.